After nearly 10 years and more than 12,000 patients treated following its FDA approval for prostate cancer treatment, sufficient scientific data and patient-reported evidence suggest that Cesium-131 delivers equivalent to, or superior outcomes compared to Iodine and Palladium for both monotherapy and combination therapy. These results, including quick returns to baseline values and fast resolution of acute side effects, can be attributed to Cesium’s combination of high energy and short half-life effectively delivering a high dose of radiation more quickly for high-risk patients in a low dose rate setting. Still, many radiation oncologists and urologists are reluctant to make the switch to Cesium due to concerns regarding planning, administrative burden and an “If it isn’t broken, don’t fix it,” position. In 2018, Dr. Bernard Taylor made the switch to Cesium as his isotope of choice for prostate brachytherapy. In this 30 minute webinar, he will share his experience including early concerns, elements critical to his successful, smooth transition and early results. 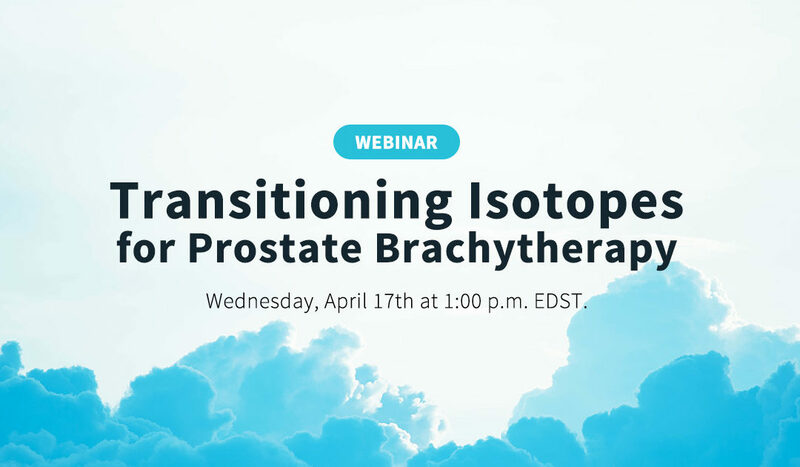 He will be joined by Dr. Atef Omari, medical physicist with Bon Secours Health System for a 30-minute webinar on Wednesday, April 17th at 1:00 p.m. EDST. Dr. Atef Omari, Medical Physicist, Bon Secours Health System Inc.
Wednesday, April 17th at 1:00 p.m. EDST.